Annexin V-PE Apoptosis Staining / Detection Kit ab14155 is used in a 10 min, one-step staining procedure to detect apoptosis by staining phosphatidylserine molecules which have translocated to the outside of the cell membrane. Analysis is by flow cytometry or fluorescence microscopy. The Annexin V-PE reagent contained in the kit is also available as Annexin V-PE reagent ab14154. 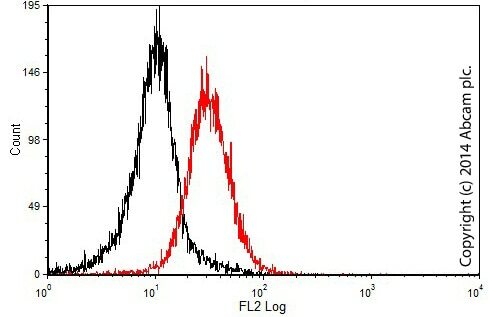 Annexin V detected in 10e4 control Jurkat cells (black) or in cells treated with 50 μM H2O2 (Sigma) for 6 hours (red). Publishing research using ab14155? Please let us know so that we can cite the reference in this datasheet. I had a query about Annexin V –PE kit Ab14155. In the attached data sheet the components are listed as Annexin V-PE/Cy5 rather than Annexin-PE. What is annexin V conjugated to in this kit? I have investigated our records for ab14155. I can confirm that this kit contains Annexin V-PE. The datasheet has been updated with the correct information and I apologize for any confusion. (Please note it can take a day or two for updated information to refresh on the internet). The quality of our products, kitsand datasheets is very important to us, as is any feedback and data we receive. It is regrettable that the information we had on this particular antibody was not of the standard both we and our customers expect from our products. I have recently purchased yourAnnexin V-PE Apoptosis Detection Kit (ab14155) to assay T cell apoptosis. For the assay I need an isotype control, however the data sheet does not mention what type of antibody the Annexin-V antibody is (e.g. mouse IgG1 etc). Whom should I contact to find out this information? The reagent that comes with this kit is not an antibody. It is PE/Cy5-labeled Annexin V protein. Annexin V will bind specifically to the membrane phospholipid phosphatidylserine, which in apoptotic cells has translocated from the inner cell membrane tothe cell surface. Dear Sir, Thank you for your kind help. I have an inquiry about your product, ab14155; Annexin V-PE Apoptosis Detection Kit. One of our customers used it with home-made 1X Binding buffer and all of cells died. The formulation of hom-made buffer is as follows. 1X HEPES 10mM pH7.4 NaCl 140mM CaCl2 2.5mM Could you please let me know your advices. Is this formulation OK? We have been using Annexin V-PE kit (ab14155) and run out of the binding buffer. Is the buffer in this kit sold separately? Does your product annexin V 10X binding buffer (ab140804) work with this kit? We appreciate your help if you could respond it ASAP. Our experiment has been set up and we are waiting for the buffer. Thank you for your enquiry. Yes, ab14084 is the replacement buffer product for this kit. I hope this information helps, please do not hesitate to contact us if you need any more advice or information.